On the eastern side of Okaloosa Island is Eglin Beach Park. This beach offers pristine white sand and serious exclusivity. Unique to Eglin, is its exclusive access for Department of Defense personnel, their family, and their guests. If you know anyone locally, there is a good chance you can get an invite to see the beach park for yourself. The exclusive nature of Eglin Beach Park means there are far fewer crowds than normal. Several large pavilions serve as perfect picnic destinations, and the jetties are ideal for snorkeling. There are even showers as well as vendors selling tasty snacks and refreshing, cold drinks. Just next to the world-famous Gulfarium Marine Adventure Park (another favorite for kids!) 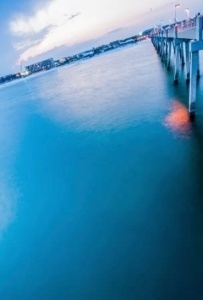 is the Okaloosa Island Fishing Pier. There is no shortage of places to go fishing on the Emerald Coast, but the Okaloosa Island Fishing Pier is a top pick for anyone fishing with kids. The long concrete pier is a hub of activity, and the entrance fee includes the fishing license. That means it’s easy for beginner anglers to watch others, learn and try out this fun sport. Parents will appreciate that there are pole rentals, snacks, and a bait shop all on the pier, making it easy to show up and have fun without a lot of advance preparation. If your kids want a change from the beach, or if the weather isn't cooperating one afternoon, take the fun to Wild Willy's Adventure Zone. This complex is a destination designed with kids in mind, and you'll notice that right away. The whole place has a dinosaur theme, and activities are inside as well as outside. At Wild Willy's, you can tee off on a mini golf course or enjoy a rush of adrenaline at the ropes course. Watch your kids race through a laser maze, and then have a blast at the arcade. Attractions, rides, games, and snacks are all found in one convenient spot at this fantastic destination. Right above the iconic Fudpucker's Beachside Bar and Restaurant is another sure-fire winner for the family: Escape Room 60. These interactive exhibits are closed rooms where the whole family must band together to escape. The two rooms at Escape Room 60 are themed to be a mummy's tomb and a mystic mansion. Up to 10 participants work side by side to solve puzzles, look for clues, and find a route out of the space. A Florida vacation isn't over until you've gotten into the water! Why wade in slowly when you can make a splash? Kids will love the chance to have their very own private, water-powered slide that propels them from the second deck of a pontoon boat right into the ocean below. Of course, kids aren't the only ones who will think the slides are a blast. Adults will appreciate the fun and convenience of a double-decker pontoon boat that can easily fit the whole family and then some. There’s a lot for the entire family to enjoy at Okaloosa Island so be sure to include it as a stop on your Florida vacation. With locations at Okaloosa Island and Destin, Double Fun Watersports, we can help you have the time of your life on a double-decker pontoon boat with two waterslides. Schedule your charter today!